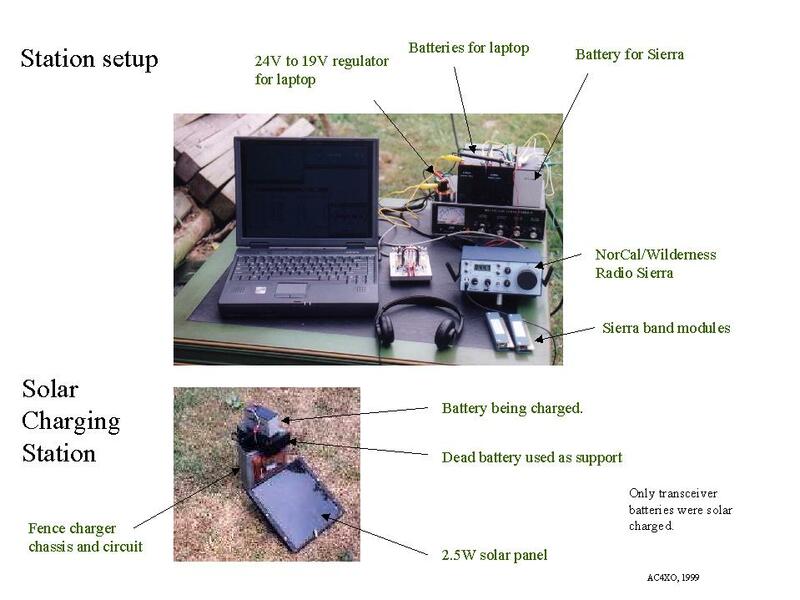 Having have fun last year doing my first QRP Field Day, I decided to make some modest changes: I wanted to add computer logging and two more bands of operation, and I wanted to go for both the natural power and emergency power bonuses. 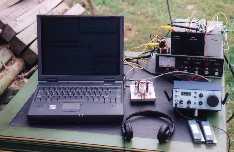 My station last year was a Wilderness Radio Sierra with a band module for 40M and a 40M inverted vee. Since last field day, I have built several band modules including one for 15M. So, I built the 10M module in June. I thought the 40M antenna would also work on 15M and I decided to add a second 10M vee at the same feedpoint as the 40M antenna. To qualify for the emergency power bonus, I needed to run all the field day equipment without the help of the power mains. This presented a problem for my Gateway laptop. I had the internal battery that wouldn't last long enough. Additional batteries are expensive, so I decided to use some old UPS gel cell batteries. Part of the fun of this field day was building a 24V to 19V regulator circuit to run the laptop off two 12V gel cells. I had purchased a copy of NA at Dayton, having used it at VTARA Field Day '96. Late in the day, I started putting up the antenna. The first step was to get a fishing line up in a tree using a slingshot. The attempt before I got the line up had a scary moment. The line snagged and the weights on the end hit my sunglasses. Thanks to my Ray-Bans, I wasn't injured. (Now I understand why the MIB wear Ray-Bans.) I got the line up in the same tree as last year. The first successful attempt was not ideal as the line was near the end of a dead limb. I was afraid the limb would break with wieght at the end, but I didn't want to take another try with the slingshot, so I left it there. KD4LQO, Sue Ellen, and I got a rope up in the tree using the fishing line I'd put up with the slingshot, and we called it a day. Saturday morning, Sue Ellen and I erected the antenna. The antenna system wasn't resonant on 15M after all and the 10M vee was very short. Since it was getting to be around 11 a.m., I decided to leave the antenna up and use a tuner on 15M and 10M. I was worried about the loss through 50' of RG-8 on 15M and 10M, but it was too late to work out a solution. I was making final SWR measurements when I heard "SNAP" and had to dodge the limb falling from the tree. Fortunately, I got another line up on the second try, and Sue Ellen and I were able to put the antenna back up without too many problems. I spent the rest of the time setting up the station and was ready to go by 2:15. It was 2:30 before I settled in enough to make my first contact. 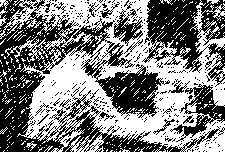 I worked from 2:30 until 10:00 p.m. with several breaks including a long supper break. Around 10:00, I was approaching my 100th contact when I noticed the laptop screen was flashing back and forth from external battery to internal battery. The UPS batteries were drained, so I made contacts 99 and 100 using the internal battery for the laptop. Due to the possibility of rain, I broke the station down and called it quits for the day. I got the station setup by 10:50 a.m. on Saturday and worked until 1:40 p.m. The second set of UPS batteries failed after about 1/2 hour, but the internal battery lasted until the end of field day with 30% battery charge left. I made 130 contacts, but two were dups. 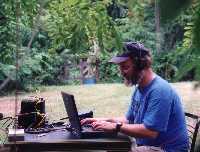 At 10 points a QSO on CW, I have a base score of 1280 points. If I understand the rules and qualify for the 200 bonus points, I'll have a score of 1480. Since my goal was to do better than last year, I am pleased. 10 meters wasn't open much, but I did manage to make one 10M contact to a station in MN. He didn't hear me well, but I was determined to make at least one 10M contact after building the 10M band module for the Sierra. 15M was great. When things started slowing down for me on 40M, I could switch to 15M, harvest it for a while and then go back to 40M. As Peter Gabriel wrote, "I ride tandem with the random, Things don't run the way I planned them." A few of my plans didn't work out exactly right. As noted above, there were problems with the antenna. I had a little trouble with band switching in NA. ALT/F2 is one of the key sequences that tells NA to start logging on another band. Fn/F2 is the key sequence to check the battery level on my laptop. So, I geed instead of hawing and told NA I'd changed bands when I really hadn't. I guess that's more of a Benjy problem than an NA or laptop problem. Fortunately, I noticed the problem almost immediately. The bright side is NA did the thing I hated most last year: it did dupe checking. The 10M band module has a very narrow transmit alignment. When I installed in the rig in the heat of a June field day, it was only putting out about 1/2 power. I had planned for this and had an alignment tool and screwdriver (to remove the band module cover) with me. It took about 3 minutes to get the module back up to full power on 10M (about 1.2 watts). What about next year? If there's an AC4XO 1B Field Day Extravganza, I want to put time and effort into improving the antenna system. I might also build 80M and 20M band modules for the Sierra. 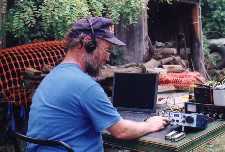 (Mike, N4GU, assures me that the CW part of the 20M band is quite civilized. And, on field day, who's going to find a spot to run one of those crazy nets?) Most of all, I'd like to improve my CW skills. I was very lucky this year with the WX. There was a little drizzle at times, but nothing to keep me from operating when I wanted to. But with the laptop, I had to be careful and watch for rain, and I had to break the station down Saturday night and set it up again on Sunday morning. So, next year I want to have some rain protection for the operating position. Thanks to Sue Ellen, KD4LQO, for help setting up and taking down the antenna. She also took many of the photographs that are on this page. Score Summary (without bonus points). Wooly faces and no bathing: The K4VPI QRP Field Day effort.